Duluth, Georgia–The Southeastern Railway Museum (SRM) announced this week that the Pullman private car Superb, which carried Warren G. Harding’s coffin in the President’s funeral train in 1923, has been listed on the National Register of Historic Places. President Harding used the Superb for a planned two-month “Voyage of Understanding” trip which began in Washington, D. C. June 20, 1923. Harding became ill during that trip and died in San Francisco on August 2. The Superb carried the President’s coffin to Washington, D. C. for the state funeral and then to Marion, Ohio, for burial. Mrs. Harding, W.B. Ross (Governor of Wyoming) and President Harding (Right) in Cheyenne, Wyoming on June 25, 1923 during his trip to Alaska. Photo donated by Rossanne McElroy Philen, grandniece of William Bradford Ross. 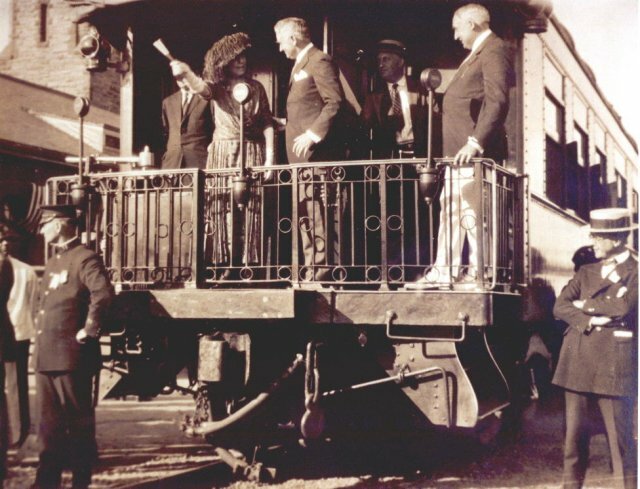 The Superb, a steel rail car which was built in March, 1911, by the Pullman Company holds a place in history on two points: it is the only existing rail car to carry the casket of a “sitting president” in a funeral train and it is the oldest “heavyweight” private car that still retains its as-built configuration. After use in the Pullman Company’s leasing pool, the Superb saw service on the Seaboard Coast Line Railroad as a business car for transporting company officials until 1969 when it was donated to the museum. After a 20-month, 2,000-hour preservation project conducted by SRM volunteers, the museum opened the Superb to the public in 1995 at its former 12-acre site south of Duluth, GA. In September, 1998, the car was moved by Norfolk Southern Railroad as part of the museum’s collection of 79 pieces of rolling stock to a new, 30-acre site in Duluth, GA. Currently, the Superb is in the SRM shop for paint touch up and other cosmetic work. When the museum re-opens this summer, the Superb will be on display in SRM’s 28,000 square foot main exhibits building with three other Pullman cars, a diesel passenger locomotive which once powered the famed Southern Crescent passenger train, and a steam locomotive which once ran on the Key West extension of Henry M. Flagler’s Florida East Coast Railway. Visitors to the Superb enter the car via the platform from which Harding gave his speeches, move through the observation room, and then down a long hall connecting two staterooms, three bedrooms, a porter’s compartment, a kitchen and a pantry. Heavyweight cars were built by the Pullman Company and other carbuilders between 1907 and 1931. They were constructed of a riveted carbon steel body frame, had two, six-wheel trucks, a clerestory roof, a concrete floor, and a steel underframe shaped like a fish belly. The Superb exists today essentially as it was constructed by Pullman. This as-built status enhances its value as a rail car representative of the early heavyweight era. For more information about the National Register and other preservation programs in Georgia, please visit the Historic Preservation Division, Department of Natural Resources web site. The Superb (Pullman plan 2503, lot 3847) is 73′ 6″ in length, 9′ 9 and 1/2″ (top of rail to top edge of eave molding) in height, 11′ 2 and 1/2″ in width, and weighs 165,000 pounds. It includes an observation room, five bedrooms (equipped with toilets and sinks), porter’s compartment, kitchen, and pantry. The car was donated to the Atlanta Chapter, National Railway Historical Society in 1969 by the Seaboard Coast Line Railroad (SCL) for display at the Southeastern Railway Museum. (SCL merged with the Chessie System in 1982 to form CSX Corporation.) SCL used the Superb as Business Car #301 for transporting company officials. The car last moved by rail on September 26, 1998, when Norfolk Southern Railroad moved the Southeastern Railway Museum’s 79 pieces of rolling stock along a 1.5 mile segment of mainline track from the museum’s old location of 28 years to its new 30-acre site on Peachtree Road in Duluth, Georgia.